Richard Gage to Speak at Georgia Tech This Weekend! 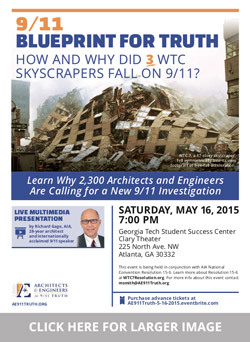 AE911Truth founder Richard Gage, AIA, will be giving his live multimedia presentation 9/11: Blueprint for Truth at Georgia Tech this coming Saturday, May 16th. The Georgia Tech presentation will mark the end of AE911Truth’s trip to the AIA National Convention, where Mr. Gage, his fellow AIA members, and local 9/11 activists will be advocating for the passage of AE911Truth’s resolution calling for the AIA to support a new investigation into the destruction of World Trade Center Building 7.